One of the best ways of enjoying the outdoors is by camping out in the open in a recreational vehicle. Family moments in the wilderness somewhere are to die for, and RV camping allows you to take your home with you wherever you decide to go. Recreational vehicles are the perfect mobile homes to decorate in your style and include all necessary home appliances, electronics and mobile gadgets to accentuate your personal style. Getting comfortable in the camping ground is assured, especially if you’ve sorted out the small issue of energy. All modern mobile gadgets, full-sized electronics, and home appliances need power and proper lighting. A quality, well rated portable generator for RV camping is a perfect way to power up your RV camping and enjoy nature without worrying too much about power. In America at any given time are about 40.5 million campers unwinding in diverse locations across the nation, of which 14.7 million are RV campers averaging 12.3 days for every participant according to Coleman Company Inc. and the Outdoor Foundation. 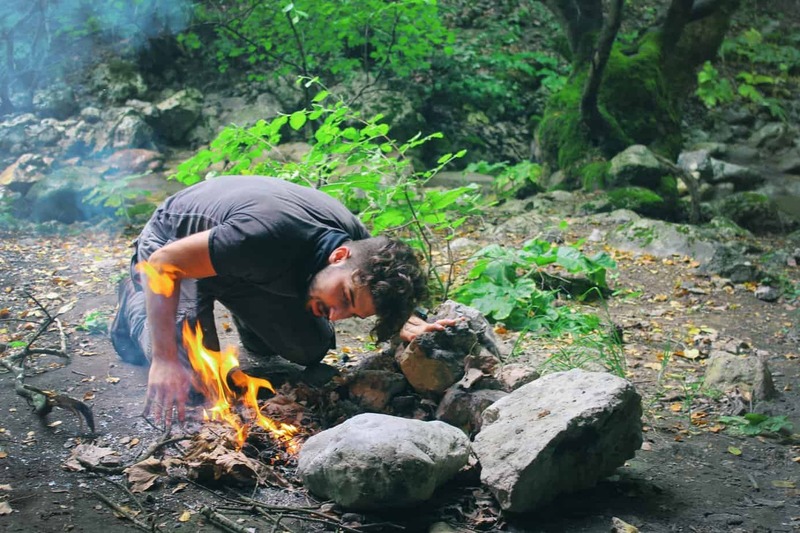 Camping is a national treat across the nation; children and teenagers make up 26 percent and young adult participants about 11.2 percent with over $1.69 billion being spent on all types of camping equipment from hydration equipment, dive watches, multi-tools to quality tents. In recent years, portable generators for RV camping have become very popular especially after dramatic makeovers that have boosted their efficiency and performance. Here are 5 of the best portable generators for RV camping you can select from to take your recreational vehicle camping to another level or just make spending time in the outdoors in the starry summer nights an unforgettable experience every time. When thinking about RV camping you’ve got in mind a portable generator with the right features. 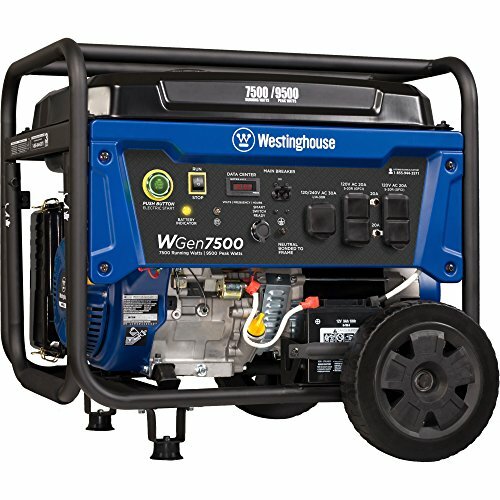 Westinghouse WGen7500 ranks very well in that regard. It includes an electric start at the push of a button. Battery charging port makes maximizing the battery life so easy and to start the engine right away whenever you need the power. A remote key fob start makes starting the portable generator stress-free even from 100 yards away. It comes with a transfer switch programmed to readily and conveniently tie the portable generator to your RV and power up all camping appliances and electronics as needed. A 25 liters (6.6 gallons) fuel tank gives you up to 18 hours of service. It’s also the easiest to maintain considering an inbuilt fuel gauge and automated low-oil shutoff. Taking it around is easy with never-flat quality wheels and a foam inbuilt grip handle for effortless maneuverability. WGen 7500 also supports standard 120V to 240V outlets perfect for RVs and homes and features water resistance courtesy of GFCI outlets and an inbuilt control panel. With peak watts of 9,500 and 7,500 watts running power, the portable RV camping generator is also protected by a solid steel frame. A sleeve wrought from cast iron protects the gas tank and the unit. The fuel tank is large enough that you can get ten hours out of the WGen 7500 at half fuel load. It’s also well rated for top fuel efficiency and has no problem starting fast at very low temperatures. With the low oil type of shutdown, you’re assured of automatic shutdown in case of oil overheating or too low level of oil to protect the engine from eventual impairment. Relatively heavier to carry than other portable generators. When the Champion brand is mentioned, durability, dependability, and experience come to mind in the engineering of diverse products. 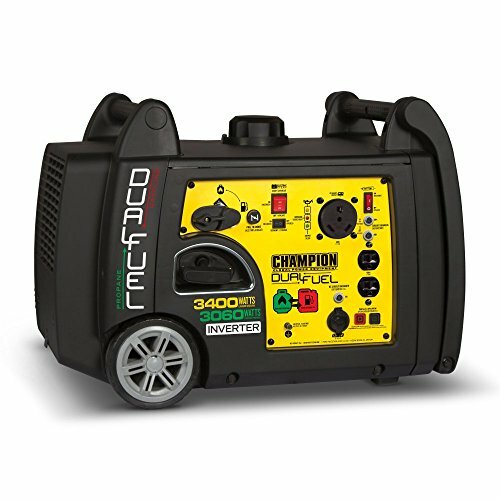 The Champion 3400 portable generator for RV camping features an electric start and dual fuel. It means you can actually fire up the 192cc engine either on propane or gasoline. On Propane Champion 3400 can run up to 14.5 hours while gasoline gets you 7.5 hours. The four-stroke, air-cooled single cylinder generator is quiet at 59 decibels. Its outlets are GFCI protected with a touch start for an electric start at the push of a simple button. It operates in 120/240V household outlets meaning you can use it in your RV camping escapades to power typical appliances and electrical gadgets. Champion 3400 also features an inlet for propane and gasoline with the fuel tank holding 22.9 liters or 6 gallons of gasoline every time. A unique fuel selector type of button adds much-needed safety, and a U-shaped portable folding handle allows you to hold it firmly. Never flat wheels make it so easy to move the generator about. It’s conveniently versatile to help you power a project, your recreational outings or even at home. A quick start in very low temperatures is assured courtesy of a cold start tech feature and a battery. The inverter from Champion releases clean power with a safety design and a low shut off oil sensor to keep you and the engine safe from damage and overheating. Switching to either propane or gasoline is done smoothly via a fuel dial selector with the gasoline choice producing 3400 peak watts and 3100 consistent running watts with only a quarter load getting you 7.5 hours of assured service. A propane tank of 20 pounds gets you 2790 running watts and starting watts of 3060 at 25 percent load and up to 14.5 hours. Economy Mode is an included smart tech on the Champion portable generator capable of reducing the electric load for tranquil operation with enhanced fuel economy. The 59dB noise level means Champion 3400-watt is just as loud as typical conversations among people. It’s also CARB compliant, and EPA certified. Quite heavy at 95.7 lbs. When you want to power up a fridge, satellite, coffee pot, DVD and television among other appliances and electronics while RV camping, you need a portable generator capable of doing exactly that. The Honda EU20001 is a top-rated choice, easy to move about and very quiet making it ideal for those special moments in a recreational vehicle. This Honda inverter generator offers peak power of 2,000 watts and 1,600 running watts always readily available. GX100 large engine is a sure feature handling big loads without any problem. Honda EU2000I eases through peak loads without issues efficiently and hardly trips its shielding circuitry. Fuel efficiency is critical in a quality inverter generator and Honda EU20001 doesn’t disappoint. Eco-throttle feature guarantees heightened total fuel efficiency while supplying much-needed stability and clean power. You can safely run all sensitive appliances and electronics whenever you want. At 53 to 59 dB the Honda EU20001 promises quiet operation. The fuel tank is a bit smaller holding a little bit over one gallon which might not get you the 8 hours promised to run at full load. 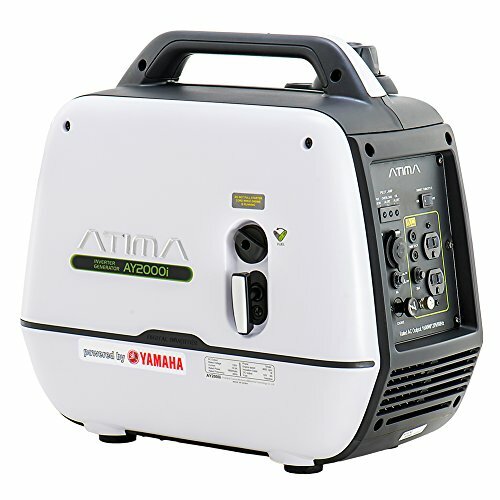 Featuring a top Japanese award winning make, Atima Inverter AY2000i is a plug-and-go portable generator courtesy of a compact design. Its compact, lightweight construction makes the Yamaha engine powered generator perfect as an emergency power backup and superb for RV camping, homes among others. Having clean top quality power in your recreational vehicle camping adventures is assured with the AY2000i. The Yamaha powered generator has been rated highly for durability by both CARB and EPA. It includes a complex tech muffler from Yamaha with a spark USFS approved arrestor guaranteeing quietness during operation with noise levels of 51.5 decibels to 61 decibels. One of the strengths of the Atima AY2000i is its compactness and portability. It’s 30 percent more compact than typical portable RV generators and 30 percent lighter. Smart Throttle feature enhances the generator’s fuel efficiency through RPM load-sensing control. Atima AY2000i takes a liter of gasoline or 3.8 liters with a maximum of 10.3 hours running time at 25% load to 4.2 hours at peak load. It’s the perfect choice to run a freezer, refrigerator, fans, mobile devices and TV among others plugged full-time while camping. Another feature worth noting is its accessible and ergonomic design delightful to use. It’s made with a simplicity of use in mind; once up and running standard electrical outlets will be ready with power in no time. Atima AY2000i features both PWM (Pulse Width Modulation) and inverter technology. Due to the inverter’s ability to offer 2.5x startup output, it actually covers lots of diverse electronics than similar portable RV camping generators in the market. It powers different accessories typical in any home or a recreational vehicle such as two-way radios, hair dryers, blenders, computers, slow cookers, DVD/TVs, portable fans, energy star freezers and refrigerators, microwave ovens to incandescent lights among others you definitely need out there while enjoying nature with family or friends. One of the obvious things you observe with DuroStar DS4000S is the unit’s portability and inexpensiveness; a perfect combination for those who want the proper power to run their recreational vehicle accessories. In the wilderness, you need to supply your family with familiar home conveniences and DuroStar doesn’t disappoint with a running watt power largely 3,300 and starting watt of 4,000. The generator is a pull start manual design with a muffler system though noise levels are a bit louder than normal conversations at 69dB. With a reasonable weight, it’s a unit you won’t be throwing around easily though highly fuel-efficient. 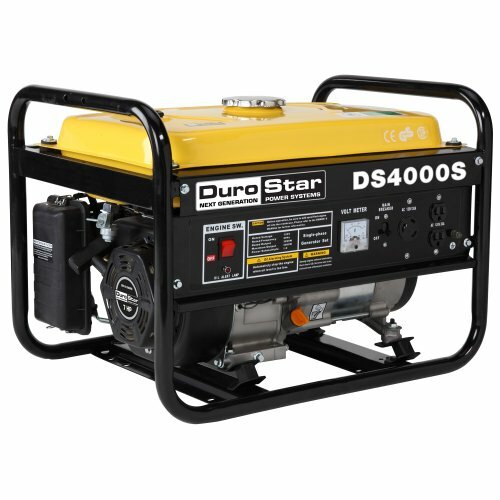 The major strength of the DuroStar DS4000S is its powerful power output that it can be used in diverse scenarios apart from camping, such as construction sites and households as a backup. It comes with a seven horsepower air-cooled engine that’s highly fuel efficient. In-built air cooling system lower risks of damage from overheating. By operating it at 50% maximum rated load, you can actually get eight hours from the DuroStar DS4000S. The fuel gauge is very simple to read allowing for easier monitoring of gas levels. It also features a solid steel frame to support the unit and enhanced with four motor mounts. The most challenging part of DS4000S is adding oil. To avoid tips and oil spills make the most of a funnel while adding oil. DuroStar DS4000S stands out due to its compact design and great easy to grasp features, inexpensive cost, and remarkable performance and power. While there’re so many factors to look into while shopping for the best portable generator for RV camping, you’ll probably be fine if you can find out the wattage you need. It’s not easy, but it depends on the amount of power you require to run your RV accessories without a problem. Calculations aren’t really for everyone, but you can easily find out the wattage that you need and the RV camping portable generator that will work for you. Simply ask yourself whether you’ll need your air conditioner up and running while camping. If you don’t need it, then a 2000 Watt portable generator should be fine. If an air conditioner is a must in your camping escapades then a highly powerful generator will do, or two quiet portable ones. Goal Zero Yeti 150 vs 400: Which is Best?